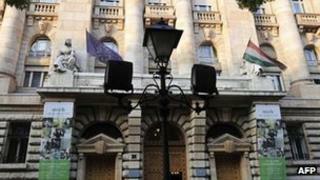 The Hungarian government has abandoned part of a planned bond auction and seen interest on the debt it did issue rise. When Hungary scrapped an auction in 2008 it was forced to seek IMF help. The country, which is not part of the eurozone, is already in talks with the European Commission (EC) and IMF over a refinancing package. However negotiators from the EC and IMF left Hungary earlier in December due to worries over the independence of its central bank. The government sold 15bn forints ($62m, £40.5m) of debt in the auction, compared with a target of 18bn forints. The average interest rate on its 10-year bonds increased from 8.78% to 9.7%. The country's debt agency, AKK, said it had cancelled the three-year auction because the range of yields offered was too wide. However it said there was not a shortage of lenders, as had happened in 2008. "The 16 billion (in bids) is not too much but is an acceptable amount relative to the 15 billion on offer, but yields came in such a wide range that the AKK decided to reject all bids," said deputy chief executive of the AKK Laszlo Andras Borbely. The unsuccessful auction follows a downgrade of Hungary's debt to junk status by Standard & Poor's (S&P) last week. S&P cited changes to the constitution that had undermined the independence of the central bank and other institutions as part of the reason for the downgrade. "In our view, the predictability of Hungary's policy framework continues to weaken, harming Hungary's medium-term growth prospects," the agency said after the downgrade. S&P also cited heightened risks to the country's ability to repay its debts due to the weakening domestic and global economic outlook. Economists say Hungary can continue to fund its spending from the markets in the short term but may eventually need IMF assistance again. The head of the IMF mission to Hungary, Christoph Rosenberg said on Wednesday that no decision had been made on when and if formal negotiations over a new standby facility would begin.